What’s the Difference Between On-page and Off-page SEO? Did you know that small businesses should allocate about 8% of their revenues to marketing? That’s right, according to the SBA, a small business with under $5 million in yearly revenue should have a marketing budget consisting of around 7-8% of their yearly revenue. The SBA points out that in certain industries, a small business may even need to earmark up to 20% of revenue during their early branding years. But wait, we’re not done with the small business math lesson yet. Research shows that in 2017, an average of 51% of all web traffic came from organic search. If your small business marketing strategy is predominantly digital, you should be spending at least 3-4% on search engine optimization (SEO). The challenge is that most small business owners don’t know much about search engine optimization. You’re an expert in your industry, not SEO. Although it probably won’t benefit you to learn how to SEO your site from top to bottom, you should know enough to talk the talk while shopping around for the right marketing services. At the most basic level, you should understand the basics of on-page vs. off-page seo, and what each of these SEO segments encompass. At the highest level, search engine optimization can be broken down into off-page and on-page SEO. On-page SEO consists of factors that a website owner can directly manipulate on their site. Off-page search engine optimization refers to the digital signals outside of one’s own website that marketers can influence indirectly. There are notable differences between on-page and off-page optimization in SEO which we will go over in the following sections. On a strategic level, off-page SEO is the more difficult and tedious of the two, so we’ll cover that first. What is Off-page Optimization in SEO? Off-page optimization consists of the actions that can be performed outside of your actual website to improve your organic search rankings.These measures are meant to reflect your website’s social credibility and industry authority. Because these search engine ranking signals come from other websites, they cannot be easily manipulated. Think of rankings as elections of web pages in the search engine results. Your page has to get the vote if it wants to be on page one. In the world of off-page SEO, those votes come in the form of backlinks. Backlinks are hyperlinks from external websites that send users and search engine crawlers to your website. Depending on their relevance and authority, backlinks can affect your organic rankings to different degrees. 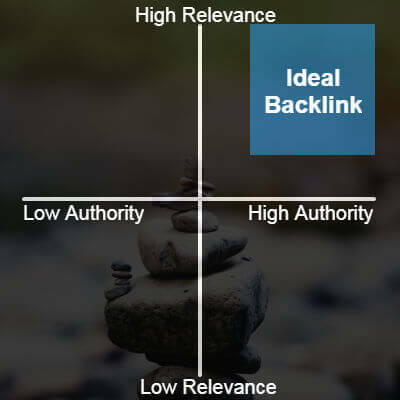 Think of the importance of each of your backlinks as being located on a Cartesian plane, where the X-axis is authority, and the Y-axis is relevance. You can have the most authoritative backlink in the world, but if it’s not relevant to your niche or industry, your pages will have difficulty ranking well. On the other end of the spectrum, if you have a highly relevant backlink from a site that doesn’t have any authority in your industry, you’re still going to find it difficult to rank. Your page rankings will not see much benefit if your links are one-dimensional on the relevance-authority spectrum. To many startups and small businesses, branding is a buzzword that only holds merit if you have venture capital money backing your organization. Bootstrap entrepreneurs tend to avoid paying for branding because it can result in exorbitant costs with very little ROI. When it comes to off-page SEO, brand mentions seem to be just as important as backlinks to your website. Since off-site search engine optimization is meant to reflect the authority of an entity in the real world, it makes sense that having social credibility in the digital world is a ranking signal. To show that the use of social signals for organic rankings isn’t entirely theoretical, take a look at the US 2016/0246789 A1 Searching Content Of Prominent Users In Social Networks Patent. Without reading through everything, this patent indicates Google’s ability to augment rankings based on what your social media connections find valuable. What does this off-page SEO signal mean for you? The more shares your content gets, the higher it will likely rank. Social shares also create nofollow links and generate real traffic, so even if you’re not concerned with improving your SEO, a social share will bring relevant traffic to your site. Now that you know about the different types of off-page SEO, consider how they can be used in your digital marketing strategy. Unfortunately, getting another website to link to your site or mention your brand is no easy feat. In today’s digital landscape, the most scalable off-page search engine optimization techniques are the least effective. Most off-page SEO experts will leverage local or niche directories, and guest blogging to build backlinks. Yext and BrightLocal are commonly used tools for local directory listing. You simply enter your business’s information, and the tools manage the footwork so that you don’t have to. When it comes to niche business listing sites, the process is typically more involved. For example, imagine that you’re doing SEO for law firms and you’d like to get listed on several lawyer directories. You’ll most likely have to enter your profile information manually on each site. When done correctly guest blogging is one of the most effective methods for building links to a website. The trick is finding websites in your industry that aren’t in direct competition with your own, and asking the site owners/managers if you can contribute a blog article for their readers. On-page optimization in SEO refers to direct measures that can be taken on your website to improve it’s rankings in search results for related queries. Examples include using related keywords in the visible content and in meta tags like your page title, image alt and meta description. On-page SEO boils down to six main factors. There are more than six factors, but the six below will get you 95% of the way. Page titles are by far the most important on-page search engine optimization factor. If your site framework doesn’t have special functionality to create a unique page title, it will usually use whatever you set as the page name in the backend of your page. If you’re using WordPress as your CMS (which I highly recommend), then you can easily use the Yoast SEO plugin to create a unique page title. The page title is what shows up in the search engine results pages (SERPs), and in the browser tab at the very top of your screen. For this reason, it’s important to optimize page titles for SEO, and for user click-through. Keep the page title length under 70 characters, and closer to 50 characters if you can. This will prevent your title from being cut short in the SERPs, while keeping it concise and appealing. It has been best practice to include your keyword near the beginning of the page title if possible. However, you’ll probably see better results if you create a title that is appealing to users and include your target keyword where it seems most natural. After the page title, heading tags (<h1>, <h2>, <h3>, etc.) are the next most important on-page optimization factors. Use the page headings like you would an outline for a paper. Headings should follow a logical hierarchy without skipping steps. It’s best to only use one H1 on a page. That being said, it’s also important that your web page is about one organized topic to begin with. This helps Google and other search engines identify and better understand what your page is about, and if your page deserves to rank highly for related user queries. Some marketers without an understanding of technical SEO use headings for their styling characteristics. For example, content marketers sometimes use H2s when they want to emphasize text by making it large, despite that text not actually being important to the main content on the page. Avoid this practice, and instead use the cascading stylesheet (CSS) to style your text. This will help you avoid emphasizing text to search engines that should really be taking a backseat. Keyword usage within the body of your page is important. I am not a proponent of focusing on using a certain keyword density, as was common practice in the early days of SEO. However, if your page is about a certain keyword topic, it’s only logical that you would use your target keyword and closely related terms within the body of the page. Similar to the primacy and recency psychological principles, it is typically a best practice to include your target keyword near the top of your page and the bottom of your page. You can use related keywords throughout your page to avoid keyword stuffing while still following on-page SEO best practices. As an interesting aside, in 2016, one of my clients’ web pages was competing with another site’s page for a high-competition keyword. The keyword was not visible anywhere on the competitor’s page, and still they were ranked page one, position two for this 1600 per month national keyword. The takeaway: though it’s best practice to use your target keywords in the body of your page, Google’s algorithm is becoming more and more advanced each day and exact match keyword usage isn’t do-or-die. Including the target keyword in your page URL is a best practice. This used to be an important on-page ranking factor, but it’s speculated to account for less than 1% of your page’s SEO value today. The biggest benefit of this practice is that when someone links to your page with a naked URL (the actual URL is used as the anchor text), the link anchor text will still include your page’s target keyword. An optimized image alt tag should include the keyword and be under 15 words. The true best practice here is to craft an honest description of the image while including your target keyword. With their image recognition technology, it is likely easy for Google to determine when someone is keyword stuffing in an image alt tag, and when someone is accurately describing an image for good user experience. Since there are limited ways to optimize an image, including your target keyword in the filename is also a good practice. This can be difficult to do when you’re optimizing images on a website that already has images without filenames that have been optimized for on-page SEO. You’ll have to save the images to your local machine, then upload them again with the keyword-focused name. As a last step, you’ll want to compress images before uploading them to your web page. You can use a free online image compression tool for most .jpg and .png files. A tool like Tiny PNG is usually a safe bet, and Google also released an open source file compression program called Guetzli in 2017. Guetzli is not as easy for marketers to implement since you cannot simply run the program with an online tool. Meta descriptions are not visible on your web page, but will show up under your page title in the organic search results. Your meta description should be around 300 characters, with an absolute maximum of 320. Many times, Google will choose their own meta description from the visible content on your page that best aligns with searcher intent. This probably has the biggest effect on an eCommerce SEO strategy, as meta descriptions and on-page product descriptions play an integral role in the overall page’s SEO value. Many of the on-page search engine optimization factors above come with insight about implementing these components. When it comes to on-page seo and off-page seo, on-page is easier because of a site owner’s ability to make direct changes. You can implement best practices on your target pages, and while blogging for SEO. You’ll just have to adjust your approach for the different searcher intent behind your keyword topics. Source: What’s the Difference Between On-page and Off-page SEO?